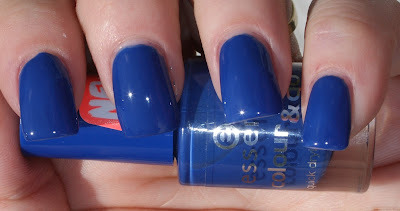 Today I have two awesome nail polishes by Essence Cosmetics for review called Wake Up and Walk on Air. They are from the Colour & Go Collection. According to Essence, the Colour & Go Collection features a flat brush and requires only one application, as well as possesses an extra fast-drying formula.There are ten new colors for the spring, bringing the total offerings of the collection up to 22! Wake Up is on the left and Walk on Air is on the right. First up is Walk on Air, a Dodger blue creme. This applied like butter and was opaque in two thin coats. I'm super manic about thin coats, so with one decent coat this probably would have been opaque. At first, I thought this was going to take more than two in order to be opaque, but it layers VERY well. I love this shade because it's a muted blue that I feel like I could wear all year long and not feel like I'm wearing too loud of a color. And you see how shiny that is? Yeah, that's WITHOUT a top coat. Gorgeous! This is Wake Up, a bright rust colored nail polish. You may remember this from my New York Sports marble earlier in the week. Again, the application was perfect and even with a thin coat was opaque with one coat. I liked this shade a LOT. 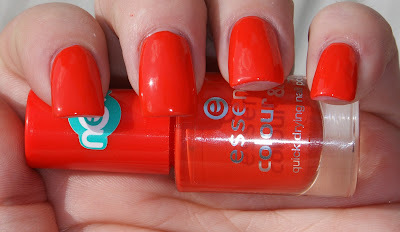 First off, it's a richer orange than any other orange I have and feels completely wearable. I didn't feel like I had a neon shade on my nails when I went outside. And you know it's a stunner when Queen Polish and the Queen Mum (aka, my Nana) are fawning over it. Again, look at how shiny that is! Both polishes dried fairly quickly, which was a plus for someone running after two dogs. Granted, it's usually the nearly four-month old Pebbles who gets into trouble, but it's Dakota who always manages to find some piece of paper to run around the house with. There are two things I LOVE about this polish, aside from how beautiful it was. Number one, you can can get the entire collection of 22 nail polish shades for JUST UNDER $22 DOLLARS! Number two, I love the fact that Essence offers all of its products (including polishes, as well as eye, lip, and face products) within the $0.99 to $3.49 range. You can barely buy a gallon of milk for $3.49 these days, so that's super refreshing! 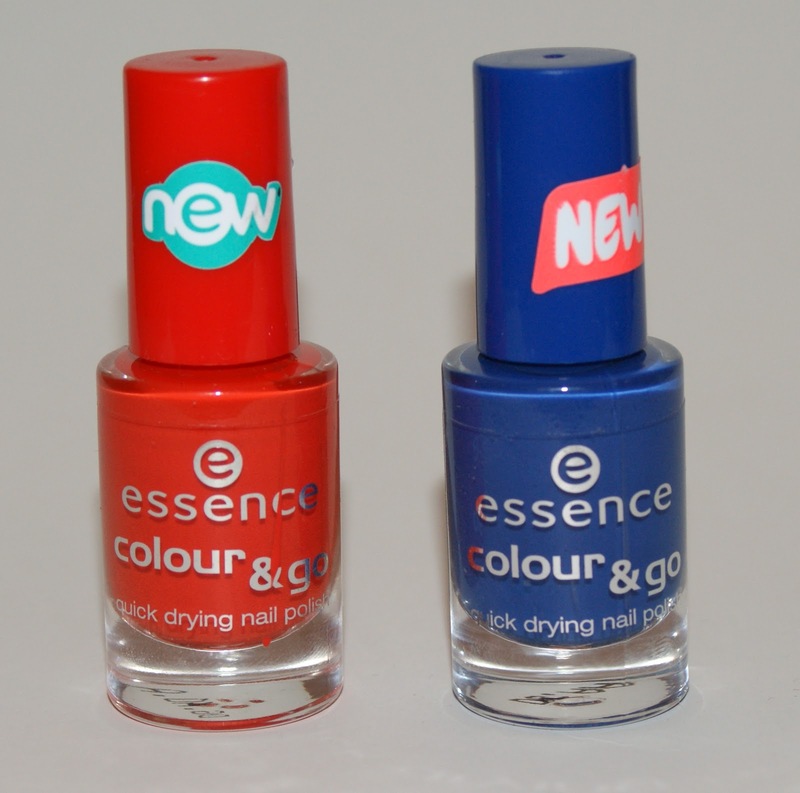 The Essence Colour & Go line of quick drying nail polish retails for just $0.99 and is sold in the United States at ULTA, HEB, and Fred Meyer. It also recently launched in Canada, where it will be available in Shoppers Drug Mart locations nationwide. 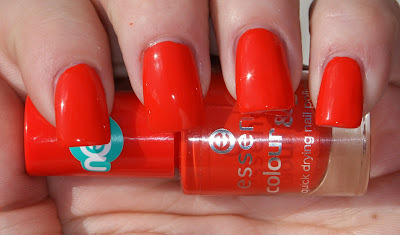 Please visit Essence-Cosmetics.com for more information on their full line of products. So what do you think, everyone? Are you going to be on the lookout for these polishes? Or have you already fallen in love? I, for one, have still yet to find Blue Addicted and it is officially a LEMMING! omggg I've gotta try Essence polishes! These colours are sooo beautiful. I hope they will be in Italy soon.